Warm up with a bowl of this hearty vegetarian chili. 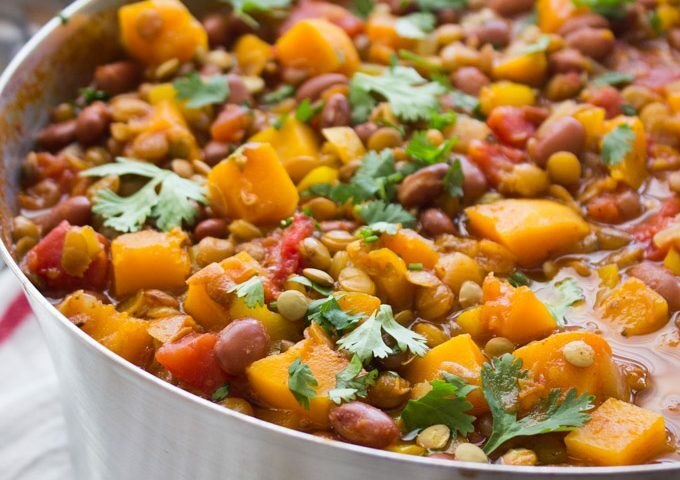 Packed with nutritional all-star lentils and fiber high butternut squash. This chunky and belly warming bowl of comfort food is ready in no time for you to enjoy any day of the week! 1. In a 6-quart heavy duty stockpot or dutch oven, heat olive oil over medium heat. Add onion, garlic and chopped bell pepper; saute for 5-6 minutes or just until the vegetables begin to soften. 2. Add lentils, cumin, oregano, chili powder, and salt. Cook for 1 minute. 3. Add tomatoes, bay leaf and stock. Bring to a simmer, reduce heat to low and simmer partially covered for 20 minutes or until lentils are soft around the edges but firm to bite. Add butternut squash and continue to simmer for 15 more minutes. Add beans and cook for additional 5 minutes or just until beans are heated through and squash knife tender. 4. Discard the bay leaf. Taste for salt and pepper and adjust as needed. 5. Serve hot with your favorite toppings, such as chopped fresh cilantro/parsley/chives/green onions, sour cream, shredded cheese, tortilla chips or chopped avocado.